First off I got an angry email from a subscriber responding to this section of the newsletter saying he HATES my politics! SO let me make sure YOU understand the following: I don't do politics. Now do I like or agree with almost anything about Donald Trump? I do not...but that has NOTHING to do with accurately analyzing him in order to see his patterns and how we can profit from him. (Note: As a guest anchor on Fox Business Network I interviewed Mr. Trump many times--trust me when I tell you IF you had actually met the man and carefully listened to him think and speak in person you would come away thinking as I did: He does not live on planet earth). Here is what I wrote yesterday about what would most likely happen as a result of the White House trade tariff policy--and OK it was a wee bit snarky but as a macroeconomist I can tell you with 100% accuracy that TRADE TARIFFS do not help America or help American labor is ANYWAY--in fat they ALWAYS 100% of the time either get smacked down by the WTO or they COST American jobs from retaliation. HERE IS MONEY SHOT ANALYSIS of the POTUS "But as we all should understand now, the current POTUS is violently allergic to bad press yet has a GIANT black hole of need for supplication from his core voting base of Intolerables." DEAD ON...if you don't understand this you have not been following his behavior--I could care less about this words and tweets." THEN I said "The Upshot: WHEN the WTO blows this insane and illegal tariff plan up like they did in 2003 and WHEN the EU/Mexico and Canada raise 25% tariffs on the main products from TrumpLand USA (hogs, wheat, corn, prepared meats, apples, grapes, cranberries and heaven forbid CHEESE) amazingly Mr. Trump will follow the pattern he has followed on every OTHER time he goes "heavy and hard against the illegal traders"--he will capitulate ala ZTE or the last round of Steel and Aluminum tariffs." Or the canceling and suddenly rescheduling the North Korea meetings. The European Union files a World Trade Organization challenge against U.S. tariffs on steel and aluminum imports, as it prepares a list of U.S. exports that could be slapped with €6.4B ($7.5B) worth of levies as soon as June 20. The EU says the U.S. measures are “pure” protectionism, as its WTO action will challenge Pres. Trump's national security justification for the tariffs; European leaders have rejected Trump's suggestions that EU countries - 22 of them NATO members - pose security threats to the U.S. Canada also is challenging the U.S. tariffs under both the WTO's dispute settlement process and NAFTA’s Chapter 20. Trump sent out a Tweet this morning that appears to threaten possible action against Canada’s lumber industry." Key point: I literally don't spend a minute of the day on "politics"--I am a capitalist and investor/investment advisor. When the POTUS makes policy that affects the U.S. macro or micro economy I ANALYSE it from an economic basis NOT a political basis. If YOU invest based on your politics that is a recipe for disaster. 18.4-100% BULLISH <2% Chance of US-based recession in the next 4-6 months. The GDPNow model estimate for real GDP growth (seasonally adjusted annual rate) in the second quarter of 2018 is 4.8 percent on June 1, up from 4.7 percent on May 31. The nowcasts for second-quarter real consumer spending growth and second-quarter real private fixed investment growth increased from 3.4 percent and 4.6 percent, respectively, to 3.5 percent and 5.4 percent, respectively, after the employment report from the U.S. Bureau of Labor Statistics, the construction spending report from the U.S. Census Bureau, and the Manufacturing ISM Report On Business from the Institute for Supply Management were released this morning. The New York Fed Staff Nowcast stands at 3.2% for 2018:Q2. This week's data releases increased the nowcast for 2018:Q2 by 0.2 percentage point. Technology stocks as we expected have been hot in 2018 after the correction and once again the Technology Select Sector SPDR ( XLK) is up by nearly 11% on the year, easily beating the S&P 500's return by almost 8 percentage points. The sector is breaking out in a colossal way, sending the ETF even higher, by as much as 8-12% based on the technical analysis of this breakout. Our favorite group has of course nearly recouped all its correction drawdown and now stands on the doorsteps of a new all-time high. The technology ETF is breaking out, with the ETF's price rising above a technical resistance level at $70.50. The resistance is just one part of a bullish technical pattern called a rising triangle. The pattern was formed at the start of May, followed by a month of the ETF trading sideways—also known as consolidation. Based on the technical pattern, the ETF appears it is set to rise to roughly $76.50, a jump of about 8%, from its current price around $71. Make It Live Click here for a cool charting system we are testing out! The relative strength index (RSI) is also showing signs of momentum returning to the sector. The RSI had been trending lower since mid-November when it hit a reading of 83, well above the overbought level at 70. However, now the RSI has risen above the old downtrend, a bullish momentum signal. The current reading for the RSI is around 66, which suggest it can continue to rise more, a bullish indication for the price of the ETF. Nvidia’s newest high-powered system for artificial intelligence and HPC (high-performance computing) applications WILL put more distance between the leader in chips used for machine learning and its competitors in what soon will be a $10 billion market ANNUAL market for machine/deep learning technology used EVERWHERE for EVERYTHING. What makes the Nvidia HGX-2 even more interesting is that it represents a platform from which partner companies and system manufacturers can design and build their own machines. NVDA's new HGX-2 platform combines 16 of Nvidia’s powerful Tesla V100 graphics chips in a single server. Using in-house designed high-speed interconnects called NVSwitch, the chips cans operate in tandem to act like a single massive source of computing, enabling customers and developers to solve some of the world’s toughest and largest AI and machine-learning problems. What makes the Nvidia HGX-2 even more interesting is that it represents a platform from which partner companies and system manufacturers can design and build their own machines. Leading server providers like Lenovo LNVGF, +0.76% and Supermicro have already stated they intend to bring systems to market this year while top design manufacturers, or ODMs, like Foxconn 2354, +1.22% and Quanta 2382, +3.96% are already building HGX-2 based configurations for deployment in some of the world’s largest cloud data centers. Computing for artificial intelligence is seen as the next technological battlefield by rival chip makers Intel INTC, +2.89% and AMD +3.93 %. AI chips and their applications could be the fastest-growing part of technology over the next decade, according to Bank of America Merrill Lynch analysts. They see the market for AI chips and other parallel computing target markets topping $10 billion in 2020, after being less than $2 billion last year. For Nvidia alone, data-center revenue has increased from $151 million in early 2017 to more than $700 million last quarter as it rolled out updated graphics chips, new server platforms, and developer services that extended its market lead. The company says the HGX-2 platform is 300 times faster than a dual-chip Intel Xeon server for artificial intelligence training and 60 times faster for high-computing tasks like data analytics and oil & gas research. The HGX-2 is the fastest and newest part of Nvidia’s portfolio of GPU-based server platforms. They offer users the ability to target workloads ranging from the most intense AI and deep-learning datasets to speech and language processing to video and image inferencing and even fluid dynamics and defense. Key Point: But it is the Nvidia SOFTWARE that is the incredible "moat" that makes Nvidia so powerful. They give it away for FREE and almost every company building AI applications use Nvidia software because it is MILES ahead of anyone else--and its FREE! The AI/Deep/Machine Learning hype sometimes obscures what is, in fact, a once-a-generation transformation and true revolution in computing. AI is not one thing; it's an entire movement to use vast computing power to find profitable and life-changing patterns and we are just a few years in 25+ years of VERY vibrant development. We own the arms merchants in the hyper-data center-based cloud AI technology AMD, Micron Technology and Nvidia. Now we have to add Xilinx (XLNX) because as a new form of computing is emerging it demands new chips. The AI transformation is every bit as profound as the rise of micro-computing in the 1970s that made Intel a king of microprocessors. This transformational change in computing makes AMD, Nvidia and Micron and Xilinx integral to the entire ecosystem. But AI will also lead to future chip stars that aren’t public now or may not even have been founded yet. Our enthusiasm for the future and present of cloud-based AI integration has rewarded us well with Nvidia (NVDA) up 770% since then first acquired it in November 2015. We also said Micron would become one of the world's most valuable companies because AI requires an order of magnitude/MONSTER amount of SSD drives and 3D memory chips. MU is up 270% since then as well. We later added and re-added AMD for its new generation of GPUs with our iniital $6.50 position now up 110%. But remember it is still WAY early in AI’s development; there will be MUCH more robust returns to come. AI computing has been around for decades. What’s known as machine learning goes back to at least the 1970s. But the internet and cloud computing happened and the internet giants had access to huge stores of data and computing power in their data centers. Computer scientists were able to create a new model of machine learning, called deep learning, that didn’t require formulating explicit rules. 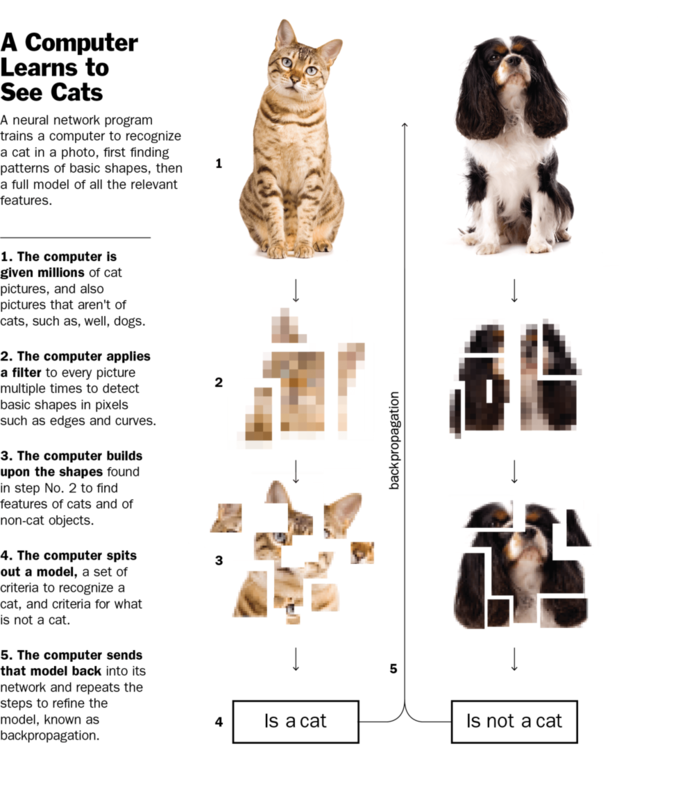 An example from Barron's of deep learning is shown in the below graphic, in which a computer is taught to recognize pictures of cats. Millions of cat photos are fed into the computer, along with millions of examples of what’s not a cat, like a dog. The computer detects patterns of very basic shapes in the pixels of the image. 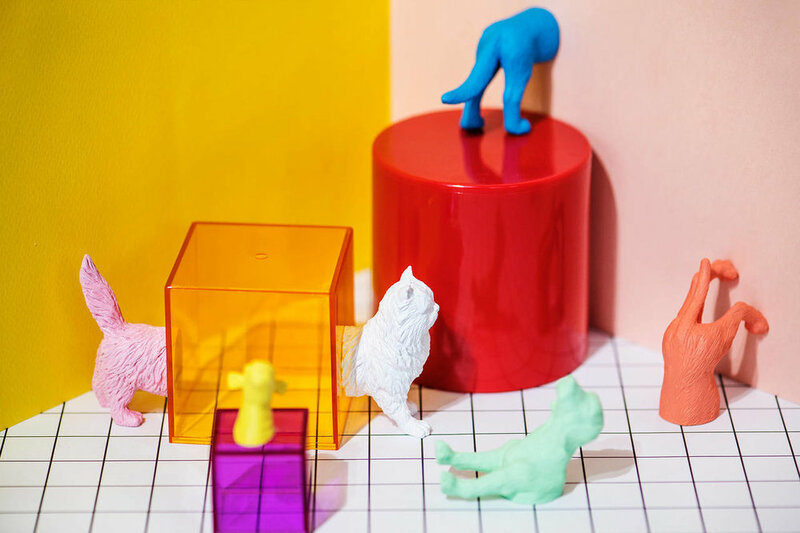 It then discovers how those very basic shapes assemble regularly into discernible features that are relevant (pointy ears) and not relevant (floppy ears). That becomes a model for the computer to use to detect a cat in any new picture presented to it. All the computing power Alphabet’s (GOOGL) Google and Facebook (FB) have at their disposal plays an important role. It allows the computer via ultra fast GPU's to run pattern detection over and over again, taking the output and using it as a new input, thus refining the model. That recursive form of discovery is known as backpropagation and was never practical before GPU's. Such deep learning is a powerful new paradigm: Set a basic objective, like classifying pictures, and let the computer discover the patterns that lead to a solution. The sequence of steps the computer goes through is called a network, and there are all kinds of different networks that are good at different things. For example, something called reinforcement learning uses very simple information, just a scenario and a set of rules, and figures out an optimal course of action. That approach was used by Google in late 2017 to make a computer system called AlphaGo Zero. It learned to play the ancient Japanese game Go with nothing more than an initial arrangement of pieces on the game board, and a knowledge of the rules of the game. No examples were needed of how humans play. After 40 days of trying moves in millions of games against itself, AlphaGo Zero was able to defeat the previous computer program, which itself had defeated all the top human players. These networks are in some cases not just learning what they’ve been assigned to learn, they are making new discoveries. As Google researchers observed of AlphaGo Zero, it found new approaches to the game. "AlphaGo Zero may be learning a strategy that is qualitatively different to human play,” they wrote in Nature magazine. Why Xilinx? ACAP will be a big part of the future of AI and Xilinx will roll it out in 2019. And ACAP will replace many existing chips and create new applications. Xilinx is best known for FPGA semiconductor chips. FPGAs have had a narrower field of use than the CPUs, GPUs, and memory chips that are more familiar to most investors. This new initiative ACAP (Adaptive Compute Acceleration Platform) will greatly expand the use of Xilinx chips, and hence revenue and profits. I believe it is smart to get in now, even though the revenue ramp will not be significant until 2020, because the news flow of this breakthrough will start to get priced in 3-4th quarter of this year. As the transistor sizes on silicon chips shrink it becomes possible to put more and more transistors on a chip. This means over time it has become possible to put more functions on a chip, like AMD's (NASDAQ:AMD) combination of a CPU and GPU on its single APU chips. ACAP (Adaptive Compute Acceleration Platform) combines multiple FPGA, memory, DSP (digital signal processing), CPU, and "software programmable, yet hardware adaptable, compute engines" on a single chip connected by an on-chip network (per Xilinx ACAP press release). In performing a given compute task, the allocation of space on the chip to these various engines, and their ability to feed each other processed data, is of critical importance. We don't have information on the specific design of this new generation of chips yet, but they will be on the cutting-edge 7 nm process node. Given different potential uses from communications to AI, a variety of peripherals will be available on variants of the chips, including analog-digital converters and programmable memory controllers. Xilinx believes "The adoption of ACAP products in the data center, as well as in our broad markets, will accelerate the pervasive use of adaptive computing, making the intelligent, connected, and the adaptable world a reality sooner." Some tasks currently take very long periods of time, even hours or days, to do on today's fastest FPGAs, CPUs and GPUs. The first generation ACAP chips, Everest, is expected to be 20 times faster processing neural networks than the current Xilinx product, the Virtex VU9P FPGA. For 5G cellular applications, Everest will enable a 4x increase in bandwidth vs. current chips. Our last 5G play Cavium was purchased at an 80% profit for us by Marvel for this same reason. So too self-driving automobiles will be enabled by ACAP's superior ability to quickly analyze data and make safe decisions. ACAP could even help the current biotech revolution continue to make advances. It should greatly speed up genetic sequencing analysis. It can also accelerate the design of molecules for novel medicines. As you know software is THE important differentiator to the competition as well. Nvidia beat AMD in the GPU acceleration for databases space largely because its CUDA software made development relatively easy. Xilinx is putting a lot of resources into making its current generation of database accelerators and ACAP easier to program. "Software developers will be able to target ACAP-based systems using tools like C/C++, OpenCL, and Python. An ACAP can also be programmable at the RTL level using FPGA tools. In Q1 2018 (reported April 25, 2018) Xilinx reported revenue of $673 million, up 10% y/y. That is good growth but would seem to put the price of the stock at the upper end of what I regard as fairly valued. 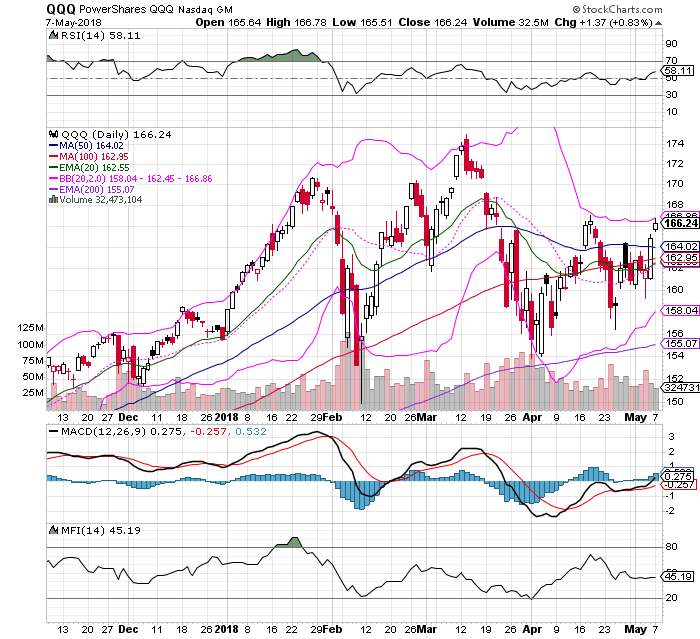 The main factor affecting the stock price, for now, is the anticipation of the rollout of 5G telecommunications equipment. Xilinx chips are used in cell tower stations. Those being sold (in its Broadcast category) right now are for 4G or in some cases for legacy 3G buildouts of infrastructure. This particular business comes in waves of a few years duration. Most likely this category will begin to ramp again in 2019 as the earliest 5G deployments are tested. Given the Xilinx competitive edge, you can count on (barring the usual caveats) a large ramp in revenue in 2020 as 5G deployments ramp up in a big way. With the first ACAP Everest chips ready for tape out in 2018, customers should get samples in 2019. It will take them time to design chips into new devices. Some industries, like automotive, have long lead times between design and buying chips in volume. But I expect some significant revenue run rate in 2020, and a ramp extending clear into the next decade for BOTH AI and 5G--we get two huge transformative waves in ONE stock! We are doubling down to buy another $10,000 on margin under $17.50 because I can't pass that up and that 22% yield covers 2% margin rate (at Interactive Brokers where I encourage you to hold your leveraged positions--they are the lowest margin shop around) AND NRZ is positioned to do BETTER as interest rates slowly creep higher (it got hit with profit taking during the market correction with plunging 10-year US bonds became a flight to safety play). LOOK at the performance and again IF YOU REINVESTED your dividends you are up 140% and getting a huge yield on your cash-on-cash return. IN other words NRZ is a great way to benefit from higher or should we say "nomalizing" interest rates. It would take me an hour to explain ALL their mortgage stratgies--this Seeking Alpha article does a GREAT job on that task. Ok that is all. With our sales of CAVM , OLED , AAOI , MBLY we have room for more Transformity Research favorites...we next add 4-5 cloud Enterprise Business Process Dominators or "Cloud Kings" companies. I am doing a new special report on what I call "The Platformity Stack Principle" and the short version is: in the cloud based technology "stack" or vertical and horrizantel layers of business processiong, the MOST valuable and fastest growing providers have achieved such a dominant position in the BPO stack they begin to have network effects i.e, they become so dominant that everyone HAS to use them. PS: I do apologize to anyone who was offended from my snarky analysis of Trump policy making! 2) The Semiconductor Index looked like it is ready to roll-over any day but it held like a champ. The U.S. stock market has obviously been stuck in a tight trading range for weeks, and a key reason for that may be simple: it has no leader to follow. Statement of the obvious: compared with 2017, when broad-market gains were particularly pronounced in technology stocks, there has been a pronounced breakdown in leadership thus far this year. “Rarely have we experienced such low leadership,” wrote Michael Wilson, chief U.S. equity strategist for Morgan Stanley, which estimated the percentage of S&P 500 sectors outperforming for two months in a row recently hit multiyear lows. The top-performing sector is consumer-discretionary, up 5.5% in 2018. However, those gains are largely attributable to Amazon & Netflix. “Our experience tells us that these leaderless periods typically occur during important transitions in the market,” he wrote. Investors are starting to fret about the strengthening dollar. The U.S. Dollar Index has risen 0.3% today, and is up 1.8% this month. The issue of course is a rising dollar makes U.S. exports less competitive and also it also hits commodity prices (that trade in dollars--which is EVERY commodity basically). Materials and industrials are two of the hard-hit sectors today. The steel industry in Europe and a handful of other American allies could face new tariffs as of midnight, after an exemption period expires, The Wall Street Journal notes. Negotiations to avoid that scenario don’t appear to be making progress. “The EU has vowed to retaliate against American exports, including bourbon and blue jeans, though any action may not be immediate,” the Journal writes. : That it slash $100 billion from the $375-billion annual trade deficit with the The New York Times writesMeanwhile, China is refusing to even discuss the Trump administration’s two boldest demands, U.S., and that the government limit its financial backing for industrial upgrades. “Beijing feels its economy has become big enough and resilient enough to stand up to the United States,” the Times writes. U.S. negotiators are to meet with their Chinese counterparts this week. Key point: IF One wondered about the Trump administration about a well-thought-out plan in place for its trade battle, my friends at Axios recently reported that when the president called for $100 billion in new tariffs on China a few weeks back, he did so pretty much off the cuff. “There wasn’t one single deliberative meeting in which senior officials sat down to debate the pros and cons of this historic threat,” the publication writes. “Trump didn’t even ask for advice from his new top economic adviser, Larry Kudlow, instead presenting the tariffs as a fait accompli.”Shocking...just shocking the leader of the free world would freelance a trade war with China off his golden cuffs. Earnings season has been unkind to bank stocks, but not their bonds. In the long-run, trust the bonds. Financial shares have trailed the S&P 500 Index in every session since JPMorgan reported results last Friday, with the industry falling to the lowest level relative to the market since November. In contrast, bond investors are taking the earnings in stride, with the extra yield demanded on investment-grade debt offered by financial firms over Treasuries hovering near a four-week low. While concern over loan growth and trading revenue is lingering, analyst estimates for coming quarters show no signs of a slowdown. Profit growth will stay above 20 percent and accelerate to 28 percent in the final period of the year, data compiled by Bloomberg show. Something’s not quite right with chip equipment stocks. ASML (ASML), makers of the cutting edge lithography equipment used to make the most advanced chips, is down $4.88, or 2.3%, at $207.82, despite an upbeat earnings report and outlook this morning, echoing the decline in shares of Lam Research (LRCX) last night, after that company also beat on both report and outlook. In our view, this quarter shows that both cycle trend and EUV momentum are moving in the right direction. LAM and ASML are both positive on the 2018 cycle, driven by both DRAM and logic spending, which are both positive for ASML. Mehdi Hosseini with Susquehanna notes that the best part of ASML’s report was that its sales outlook for its tools "has remained unchanged at 20 (new) system shipments in 2018 and at least 30 (new) systems in 2019." Intel Corp. reported a blowout March quarter led by strong growth in its data-centric businesses, but questions remain regarding the sustainability of the company’s results as well as issues with 10-nanometer chip production. “We think consensus was expecting strong results, but these were truly impressive,” wrote SunTrust Robinson Humphrey analyst William Stein. Intel beat earnings and revenue expectations by a wide margin on Thursday afternoon and reported 25% growth for its data-centric businesses, excluding McAfee. Data-related revenue accounted for nearly half of Intel’s INTC, -0.60% total sales for the quarter, a company record. Advanced Micro Devices is on a roll with chip releases, the likes of which it hasn’t achieved in more than a decade. On the back of solid and consistent execution, the Ryzen 2000-series of PC processors launches this week and addresses several critical consumer markets. Previously called the Pinnacle Ridge platform, this new family of processors is aimed at the DIY (do-it-yourself) and personal computer (PC) gaming markets, in addition to computer manufacturers such as Dell and HP. The chips offer a better value and performance alternative to Intel Core-series, which has a dominant market share. But the company is making strides. AMD claimed as much as a 50% share at component-specific retailers in 2017 and a resulting rise in market share to 12% in the fourth quarter from 9.9% a year earlier. Early reviews of the new chips indicate performance and feature improvements are solid over the previous generation and outperform the latest offerings from Intel in specific multi-tasking workloads. This is considered a “minor revision” of the previous chips, to tweak and perfect the current architecture rather than completely revising it. That is a task assigned to the “Zen 2” products coming in 2019. Ryzen PRO family over the past year, AMD has launched dozens of new products in the processor and graphics chip markets. Those include the first-generation Ryzen processor, the business-targeted and the enthusiast-class Ryzen Threadripper,which pushed performance ahead of what Intel offered in the same category. In the server space, EPYC brought AMD back in the discussion for data center processor sales, an area it had dropped to nearly 0% share. HPE, Dell, Cray, Microsoft and others have announced EPYC-based deployments. Ryzen Mobile created a product for thin and light notebooks with several technology advantages that can challenge Intel’s dominance in that part of the market. In graphics, AMD launched several consumer and professional products based on its Vega architecture, bringing the company back into the competitive world of high-end gaming. Nvidia NVDA, -0.65% maintains market share leadership, but AMD is back in the game. Its Radeon brand gained more than 10% revenue share in discrete graphics chips last year, though how much of that is a result of cryptocurrency trading is up in the air. I'm going to let the new GDP and wage growth numbers come out tomorrow to update ALL the other positions with buy under.